Erchless Castle is a historic and romantic Scottish Castle situated on a private estate in the fertile land of the Glen of Strathglass near the pretty town of Beauly. The spacious rooms contain many original antiques and bring a real sense of history and splendour to this magnificent building. It is an ideal base for enjoying the stunning local scenery and exploring the riches of Loch Ness, Glen Affric and the surrounding area.Please not that we must respect the privacy of our guests and the castle is not open for tours or visits. Factors Cottage is the end one of three Victorian listed stone cottages in the grounds of Erchless Castle. The rooms are airy and spacious, yet cosy in the winter with central heating and the wood burner. Please note that guests in the cottage do not have access to castle facilities such as the hot tub. The separate dining room in the cottage is ideal for getting around the table in the evenings and catching up on the day before settling down by a log fire. Watch for deer and red squirrels in the fields and forests or salmon leaping in the river as you enjoy walking through the estate. Whether you wish to play golf, ride, visit the local distillery or explore the area by foot or bike there is an abundance of things to do and see from watching dolphins in the Moray Firth to visiting the historic sites of Culloden, Urqhuart castle and Castle Leod. Spend a day visiting the west coast on the wonderfully scenic railway from Beauly to Kyle of Lochalsh or watch the water thunder down the drop at Plodda Falls a few miles away near the pretty village of Tomich. The relatively short distance from Inverness airport makes the area very accessible for a short break in the spacious and well-equipped cottage or the magnificent historic castle. The estate is privately owned by the Hon M Robson whose family have owned the estate for over 60 years. Until the 1930's the castle was the seat of Clan Chisholm. This magnificent castle is surrounded by farmland in an area of stunning natural beauty, with the dramatic landscape of the hills beyond, yet it is easily accessible by road rail and air with Inverness being only 40 minutes away by car. Fantastic for getting together with family and friends, relaxing round the fire in cooler months or enjoying the hot tub in summer. The games room and full size snooker table can be a welcome diversion on a wet day, but the extensive grounds are a joy to explore whatever the weather. Comfortable beds, including two four posters, luxurious Toiletries from the Highland Soap Company and thick fluffy bathrobes help to soothe aching muscles after a day on the hill or just visiting local places of interest and ensure a good nights sleep. We can also supply delicious home cooked meals on request for your arrival. - just ask for details. 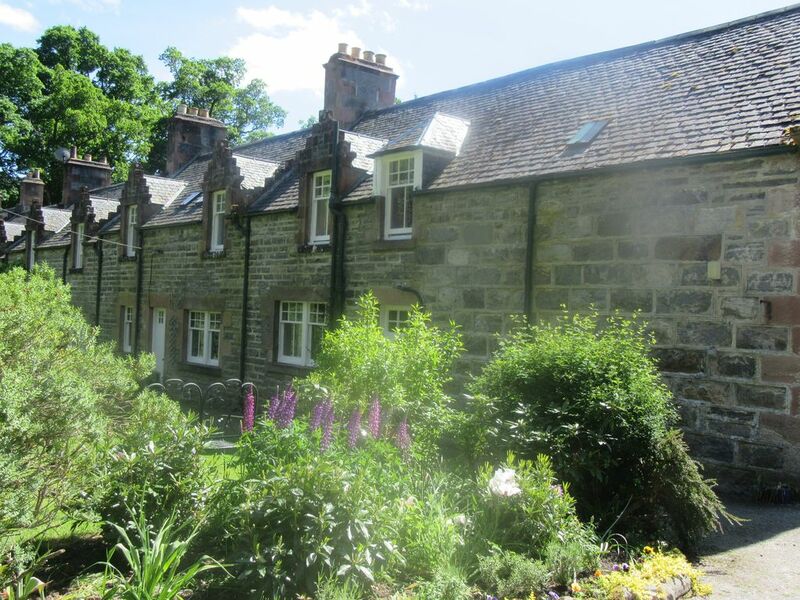 The well appointed cottage, situated opposite the Erchless Burn, is ideal for smaller groups or families wishing to explore the area or watch the local wildlife. Easily accessible to local attractions such as Loch Ness, Glen Affric and the small town of Beauly, it makes a perfect holiday location. The castle is comfortable and spacious with a unique sense of history and wonderful views across the glen to the hills. The peace and tranquillity of the surroundings with the gentle lilt of the river in the background make it a paradise for relaxing and seeing local wildlife . including the native red squirrel. For several centuries it was the home of clan Chisholm and still retains many original features. A Scottish Munor is 3,000 feet - there are several nearby if you want an exhilerating climb and a good view. yes - it is the Highlands so no high fibre broadband. ! Basic cleaning and kitchen items included eg wasing up liquid bin bsgs, foil, salt and pepper etc. Well equipped kitchen includes :Dishwasher, Fridge, Freezer, range cooker, sink, kitchen table. Notes on accommodation: Spacious comfortable accommodation with all the charm of a well loved family home, perfect for friends and family gatherings, humungous dining room table for sociable dining, cosy log fires and stunning views. All our bedlinen is Egyptian cotton with cosy feather duvets, pillows and mattress toppers. We have one double room with wool bedding suitable for allergy sufferers and provide toiletries by the Highland Soap Company. Non smoking. Outside: The castle is in a wonderful setting, lawn and barbecue area outside, croquet lawn and set, outdoor hot tub for summer use (castle only), peaceful gardens with river and stunning views. Mountain bikes available subject to availability at nominal charge. Cottage also has lawn and barbecue area. Lovely Victorian Factors cottage-ideal base for exploring the Highlands. The cottage is lovely and peaceful, has everything you need and is tastefully furnished and decorated. It is an ideal base for exploring the surrounding Highlands. You can see red squirrels, pine martens and lots of wild birds from the cottage windows.The housekeeper that lives next door is very friendly and welcoming and has local knowledge of some nice walks. I would recommend staying here.We had an amazing holiday. We visited the local glens and lochs. We saw bottlenose dolphins in the Moray Firth. We also went further afield to the Isle of Skye and Ullapool. This property in a 19th century building that once housed workers for Erchless Castle. The flat is very spacious, and was clean. The on-site managers Allison and Greg are more than helpful and very knowledgable. We enjoyed talking to them daily. The setting is gorgeous! The cottages are on the property of Erchless Castle, which looks more like a manor house than a castle. Renters do not have privileges on the castle grounds itself if the castle has guests, but you can still see it from lovely local walking paths. The surrounding community has a rich history. Though there is a written history of the castle in the flat, we recommend also reading the history of the area made available during a good meal at the Gnoc Hotel just down the road. We wish we had longer to stay and explore all the hiking trails and communities nearby. There are three bedrooms. One has a queen bed with a bathroom (tub/shower) next-door. The second has an ensuite shower only. The third has twin beds with an ensuite bathroom with shower. There was also a large living room, large kitchen, and dining room. There is a hair dryer in each bedroom. The kitchen is well stocked with appliances, but remember to bring your own coffee (we left a little that we'd brought). The bathroom has locally made liquid soap and shampoo. Bring your own Kleenex. You need to know that this property is 18 miles outside Inverness, and not on a bus route. We actually enjoyed being away from town and would stay here again if in the area. Location and home were excellent, and hosts most accommodating (great eggs!). Some photos on the vrbo site are actually of the Castle on the premises and not of the cottage; for example we expected a hot tub from the images but that was only at the Castle. In addition, we booked in part based on the cottage having WiFi, and for practical purposes it did not. I’m sure that is a general problem in the Highlands, and maybe I should have been more aware of that. However, lack of good internet access made it impossible to do the work we needed to do while there, but not having fast WiFi access did allow us to enjoy the natural scenery of the place. Overall, we liked the house. I am sorry that there was a misunderstanding about the hot tub -I will try and make it clearer.wifi can be sporadic and seems to depend on the weather in part but I am very glad that you had a good trip-we do our best to ensure guests have all the information they need and are always available to answer any queries. We enjoyed the cottage very much, the surrounding countryside is absolutely beautiful and so peaceful and relaxing. The caretakers, Allison and Greg, were very accessible and helpful. The bottle of wine upon arrival was much appreciated (sadly, no Highland biscuits as promised, but oh well!) The nearby Cnoc is great for local fare and a drink, and across the road is a hidden Chisholm cemetery tucked within the woods that is worth exploring. There are several small towns nearby that are worth the drive to experience. My biggest disappointment is that there is NO ACCESS TO ERCHLESS CASTLE, not even for a picture. It is very clearly marked as a private residence and was secured by a locked gate. I wish this would have been communicated in the description, as this was one of the main reasons for staying in the cottage. The description insinuates otherwise, which is somewhat misleading. Overall, a nice stay, just wished we could have walked around the grounds of Erchless Castle. I hope you enjoyed your stay and I am sorry you were disappointed at the lack of access to the castle . I am happy to send you a couple of packs of biscuits though ! This is a perfect country retreat. The house is very well equipped and comfortable! The property manager, Greg, is so nice and helpful! How lucky were we to find this gem in Struy!! It is private, quiet, clean and was a perfect place to use as home base for exploring the area. The cottage was so spacious and gave us plenty of room to spread out, which we needed after a day of Highland adventures. Jilly was so easy to work with and responded to my numerous questions promptly. The on-site facilities manager and his wife were generous and kind and we thoroughly enjoyed our time there. I would recommend staying at the cottage!! Salmon fishing and stalking in season. We can also arrange group activities such as archery, or mini highland games,.There are many good golf courses nearby. Canoeing on the river can be arranged , a falconry experience or even dog sledding in winter, The cottage is an ideal base for cyclists with the stunning glens of Strathfarrar Glen Cannich and Glen Affric nearby.Enjoy watching the local wildlife onteh banks of the burn. There are regulr visits from red squirrels, badgers, pinemartins and numerous songbirds, Red deer live on the hill and Roedeer are often seen in the Glen. The history of the area as the former home of the Chisholms is interesting and enigmatic. The monument on the other side of the road in memory of the last Chisholms t living in the castle is deeply moving. Visit the distillery at Muir of Ord or enjoy the shores of Loch Ness.Urqhuart Castle on its shores is historic and intriguing and makes a good family day out The well known beautiful Glen Affric is nearby, and Plodda Falls are a must to visit. For the more energetic it is possible to bag three Munros in a day. The scenic railway from Beauly to Kyle of Lochalsh on the west coast is good for a more relaxing but scenic journey. Culloden, Castle Laud,and the Museum of Childhood are all within easy reach. Inverness has all the attractions of a city and it is a delight to discover small restaurants, the castle orwatch the boats on the Caledonian Canal. Forty minutes by car to the moray firth for coastal activities and where seals and dolphins are a common sight. Inverness airport forty minutes by car. Flybe and Easyjet fly to Inverness. Car recommended.Nearest local railway station is Beauly 8 miles away. Loch Ness, Drumnadrochit, approximately 12 miles. Muir of Ord distillery, Strathpfeffer, Castle Leod approx 15 miles. Inverness 45 minutes by car. Estate produced meat (beef and lamb) is available and can be pre ordered and put in the fridge for your arrival. Local store and pub at Cannich 8 miles, restaurants shops in Beauly 8 miles. Small hotel with restaurant 1/4 mile easy walking distance.local pub 1/2 mile. Subject to availability, there is an accomplished local piper who will play in the castle grounds by arrangement. Local small plane trips can also be arranged. Booking Notes: Please phone for details - deposit 25%, full payment required six weeks before let Changeover Day: Sunday Notes on prices: Short breaks often available at 75% of weekly price on request out of high season - please e-mail details of request and we will get back to you.